Peppermint oil has also been shown to be a safe and effective short-term treatment for irritable bowel syndrome and has been used internally as an antispasmodic and to treat irritable bowel syndrome, catarrh of the respiratory tract, and inflammation of the oral mucosa. Externally, peppermint oil has been used for muscle pain and nerve pain. Peppermint oil may also act as a carminative,cholagogue, antibacterial, and secretolytic, and it has a cooling action. Peppermint has a long tradition of use in folk medicine and aromatherapy. Peppermint is commonly thought to soothe or treat symptoms such as nausea, vomiting, abdominal pain, indigestion, irritable bowel, and bloating. The aroma of peppermint has been studied for its possible memory and alertness enhancing properties. Peppermint has been used for centuries as a digestive aid and is particularly effective in calming the intestinal muscle spasms that cause abdominal pain. The volatile oils contained in peppermint, particularly menthol, are the key active ingredients although the other constituents may also contribute to the plant's therapeutic effects. Peppermint may reduce nausea, colic, bloating and wind. 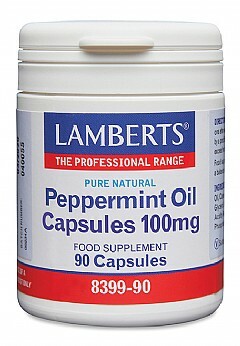 Lamberts Peppermint OIL 100mg is a high strength natural peppermint oil digestive aid distilled from mint. It calms intestinal muscle spasms that cause abdominal pain.